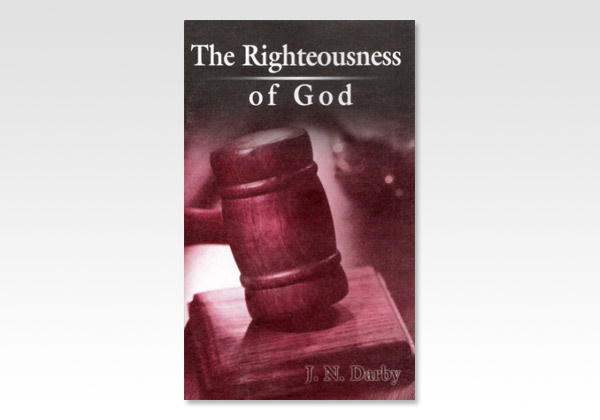 Before entering on the solemn and interesting question of our righteousness, the righteousness of God, I will shortly notice what is objected, and dispose of it, so as to be able then to treat the subject unhinderedly for edification and not controversy. The principle in question it is well to state; it is, I fully admit, a most grave and important one. Not that beloved and truly godly souls have not been, as I judge, cloudy upon what was really of great moment to their true and godly liberty in Christ, which is the power of a Christian walk; not that they have not been violent, as men generally are, in the sustainment of that in which they are wrong. But this does not destroy the importance of being clear. Still, I freely and fully, yea, joyfully, acknowledge (as choice and devoted servants of Christ, whom I respect and whose devotedness I look up to) persons who have held, on this subject, doctrines which I believe to be a mistake. I have thus no animosity as regards this point. The point, however, is important, and what saints have held by infirmity of judgment may become a very great hindrance to the progress of souls, and a weapon in the hands of the enemy: witness the Judaism of the early church at Jerusalem, and the opposition raised to Paul on the very same ground. The principles, indeed, which were then in question are the same which now partially agitate the church of God, and largely hinder its blessing and testimony, and obscure its faith. Christ was, in sovereign grace, made sin for me and died, not to build up the old man again, after death, when it was dead, and confer righteousness on it, but to put me in a wholly new position in the heavenly man, who is my righteousness - to set me in the righteousness of God, seated in heavenly places in Him.